Sake is no longer an exotic drink from a far-off country, unavailable and unloved in the UK. There’s an increasingly die-hard following for Japan’s most famous alcoholic export, led by enthusiasts, bloggers, buyers, andsake sommeliers, the go-to people when you want to know which sake is perfect for your dinner, party or event. People like Natsuki Kikuya, a former Head Sommelier at ROKA, and now as the founder of the Meseum of Sake, an invisible museum which provides sake education and tasting experiences, to spread the word about the delights of sake. So much so that she was awarded the IWC Sake Communicator Award in 2011. We talked to Natsuki about her work, her inspiration, and her experiences with in the UK. Natsuki Kikuya was born into sake – her grandfather was part of a cooperative of sake makers in Akita Prefecture – but, away from the brewery in Tokyo, with her parents, never really felt it to be part of her life: “Nobody under the age of 35 drunk it, and I just didn’t feel connected it to it”. It wasn’t even until her early twenties, when she brought some friends from the American university at which she was studying back to Japan for a sightseeing tour, that she first visited the Akita brewery. “I took my friends there, because I thought it would be interesting for them. But it was me who was the most impressed; it was a moving experience for me”, says Natsuki. At the time, Natsuki was studying documentary film making, a creative process which often involved delving deep into the private lives of families and exploring the roots of communities and societies. “But I suddenly realised that I’d never thought about my own roots”, says Natsuki. “I started to research the history of my family’s brewery. It turned out my family had been brewing sake since 1630, for more than three and a half centuries, which is an incredible legacy”. In the meantime, Natsuki had returned to Japan and started to work in a company in Tokyo. She might have remained there, in one of city’s many office blocks, had her grandfather not fallen ill in 2008. Although now recovered, this illness prompted Natsuki to reflect on the “incredible legacy” that her grandfather, the latest in a long line of brewers, was protecting. “He was always so proud of his sake, it was something very special that had been passed down over all those years. And I started to think about what would happen to that legacy, all that passion, if someone didn’t get ready to take the helm”. In September 2009, Natsuki made the decision to move to the UK, in order to heighten her understanding of the overseas market for sake. 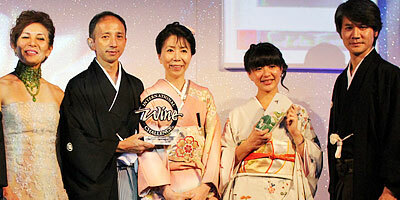 The IWC Sake Communicator Award, which Natsuki received just two years later in 2011, is run by the Sake Samurai Association in partnership with the International Wine Challenge and is an opportunity for bloggers, winewriters and journalists to showcase their knowledge and enthusiasm for passion. Natsuki’s blog, written in both English and Japanese, introduces her life in the UK, sake that she loves, and food pairings, too. On arriving in the UK, Natsuki was immediately aware of the relative lack of popularity of sake, compared to American, for example, where sake has been enjoyed widely since the 90s, particularly on the New York sake bar scene. “It seemed to me that most people didn’t really know the basics of sake. People think it’s a spirit, that there’s only one kind, that you always drink it hot, that it’s strong and gives you a hangover”. In truth, she’s keen to emphasise, sake is as much about the brewer as wine or beer. “There’s a whole world, a whole culture behind a bottle of sake: the inspiration and the efforts and the innovation of the brewer”. It is these breweries, often generations old, that Natsuki is so keen to support through her work. “In Japan, the number of breweries has dropped hugely in the last few years, from 2,327 in 1989 to around 1,500 now, of which around 800 are at serious risk of business failure”. By working in the UK to correct misunderstandings, enthuse people about sake, and come up with new ways of drinking and pairing sake that will really get British drinkers and foodies excited, Natsuki hopes to create new business opportunities for the truly outstanding sake still being produced in Japan today. “I think it’s okay to move away from conventional ways of making and drinking sake; we’re seeing sparkling sake, for example, or low alcohol sake, and these are particularly good for people who are new to sake”. Natsuki also points out that the food eaten with the sake and the season in which the sake is made, and drunk, are all important in enhancing the enjoyment of sake. And that’s what she does on a day to day basis in her role as Head Sommelier at ROKA in London: “I’ve definitely seen a change in the level of interest and also of awareness among customers”, she says. “More and more people are trying more and more types of sake, and obviously I hope that will continue”. Don’t write it off after just a couple of goes. Try as many different kinds as you can, and if possible go somewhere with a sake sommelier, somewhere that knows its sake. Give it five or six tastings; you need that to start to appreciate the breadth of taste, aroma and temperatures that you can encounter with sake. If you know what you like with wine, speak to the sommelier and he or she should be able to recommend you something based on that. For example, if you like your wine crisp and light, like a Reisling, then you might enjoy a chilled daiginjo with a very aromatic nose. It works with spirits, too; if you like your drinks to be dry and bold, rather than soft and mellow, you could try a honjozo. 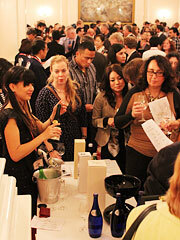 Try and attend a tasting or event that will allow you to taste and compare lots of different sake at once. A la Japonaise is a pop-up event of food with sake, or keep an eye out for events featured on this page.